Missy McCormick is originally from the Atlanta, GA area. 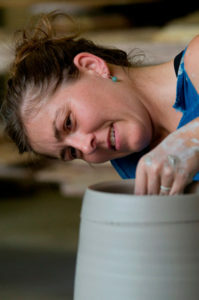 After graduating with her BFA in 3D/Ceramics from Georgia Southern University in 1994, she started her clay career as a production potter in North Georgia’s Appalachian Mountains. From there, she received a MFA from the University of Florida in 2001 and began teaching ceramics in a variety of different academic programs across North America. Creative thinking and problem solving feed her passion for teaching, and she is always encouraging her students to explore and grow to fully understand their individual potential. After spending over 10 years working solely with soda and wood firing processes, Missy has transitioned her creative research to incorporate atmospheric results at low temperature, fuming terra sigillata surfaces on functional earthenware clay forms. This direction has inspired the use of a new pallet of color, surface, and decorative possibilities. Her inspiration for this shift was spurred by a visit to the Cleveland Museum of Art while teaching a summer course in 2001 at the Cleveland Institute of Art, where she stumbled upon a collection of Persian miniature paintings. The intense detailed patterning, subtle value shifts of the backgrounds, and asymmetrical framing of the compositions continue to keep her intrigued. Before coming to Youngstown State University, Missy McCormick taught at the following institutions: University of Wisconsin, Madison, University of Arkansas at Little Rock, Florida Atlantic University, Alberta College of Art and Design in Calgary, Alberta, Canada, and Georgia Southern University. Other creative endeavors include helping start up a community ceramic art studio, Whistle Stop Clay Works, and co-founding the Loveland Farmers’ Market in Loveland, OH.